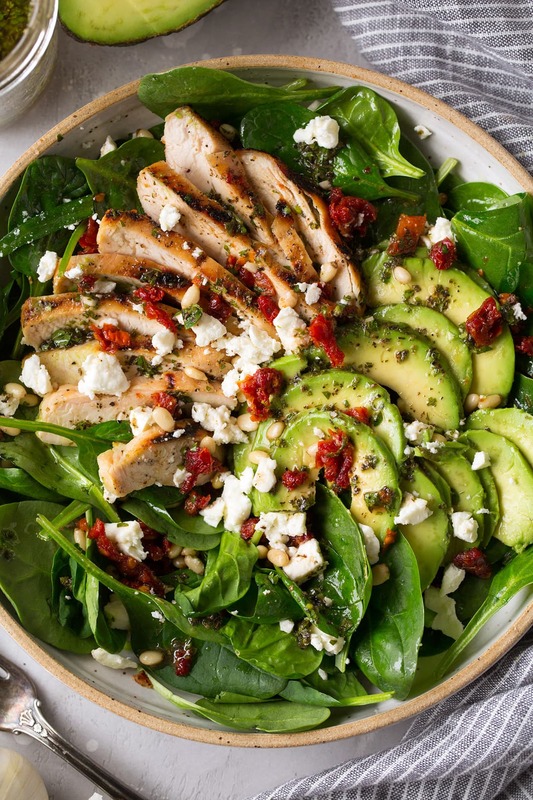 Grilled Chicken Sun Dried Tomato and Avocado Spinach Salad is jam packed with flavor and nutritious ingredients and it’s perfect for a weeknight dinner! 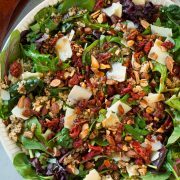 It’s rich in protein and the bright flavors in this salad and will leave you craving it time and time again. 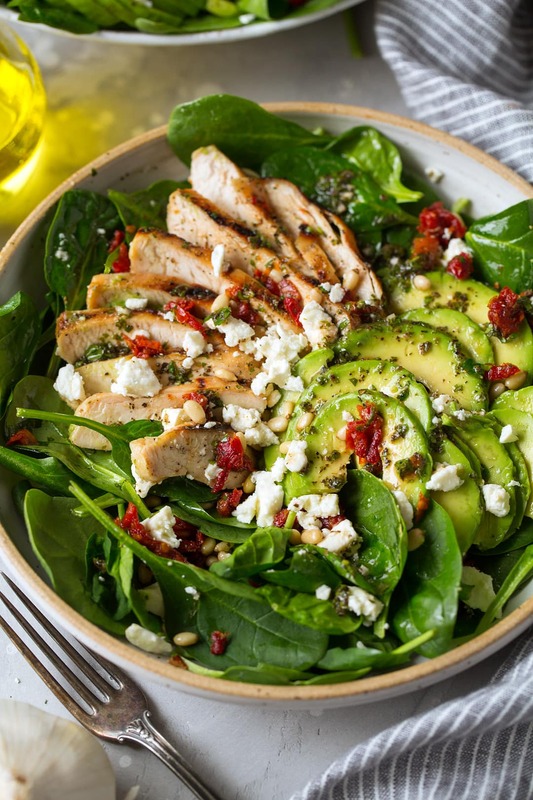 This salad layered with plenty of fresh baby spinach, lean grilled chicken breasts, creamy avocados, rich sun dried tomatoes, salty feta, crunchy pine nuts and it’s finished with a tangy lemon herb dressing. After one bite I realized it’s been too long since I’ve made a grilled chicken salad. 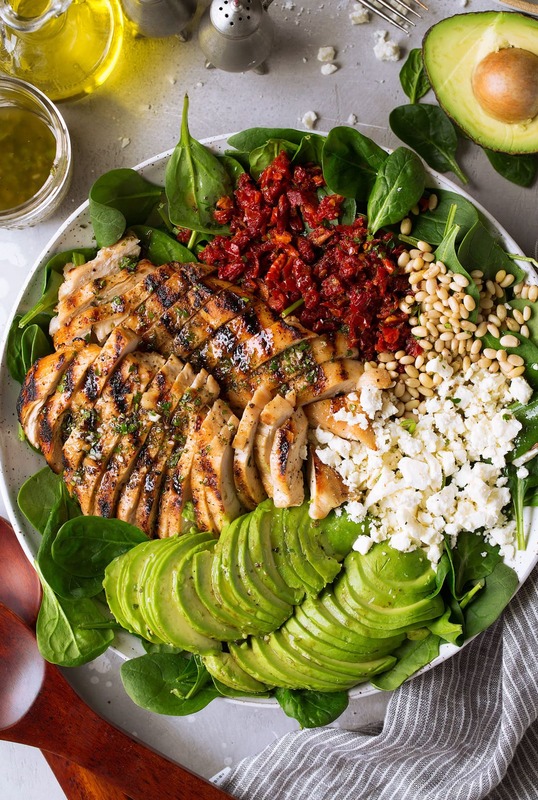 Grilled chicken salads are the best – especially when there are avocado included! 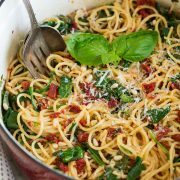 Those sun dried tomatoes here really do pack a flavorful punch, which is why you’ll only need a small amount. Normally when I add tomatoes it’s like 3 big fresh tomatoes (because I’m obsessed) but here 1/3 cup of the sun dried tomatoes will go a long way. My husband normally hates tomatoes but he loved this salad and actually requested it again for lunch the next day. Sun dried tomatoes have such a different flavor from fresh. Is There a Substitute for Pine Nuts? And you can substitute another nut here for the pine nuts – sliced or slivered almonds or chopped walnuts are a good choice (but chop them so you get more in each bite). I love the bit of crunch the nuts add to the salad. And do feel free to add more. How Can I Get Chicken Breasts to Brown Better? As a side note I found the key to nicely charred chicken breast is a pinch of sugar on each side. Since they are so lean they don’t tend to brown well without it. I also like to pound to an even thickness and season with a little garlic powder and of course salt and pepper. Oh and brush with a tiny bit of oil before adding your seasonings. Then cook on a 425 – 450 degree preheated grill about 4 minutes per side for 8 oz. breasts (or until 165 in center). Also you may notice it’s not much dressing for 4 servings, the first time I made it with more dressing but found it to overwhelmingly oily between the dressing, oily tomatoes and avocado. So the next time around I cut back and I think the amounts listed for the dressing are just enough. 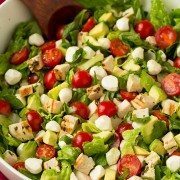 This is such a flavorful and satisfying salad! It's layered with so much goodness and the way the flavors compliment each other here is spot on delicious! A recipe you'll want to use again and again. For the dressing, in a mixing bowl whisk together all dressing ingredients and season with salt and pepper to taste. Divide spinach among 4 plates. 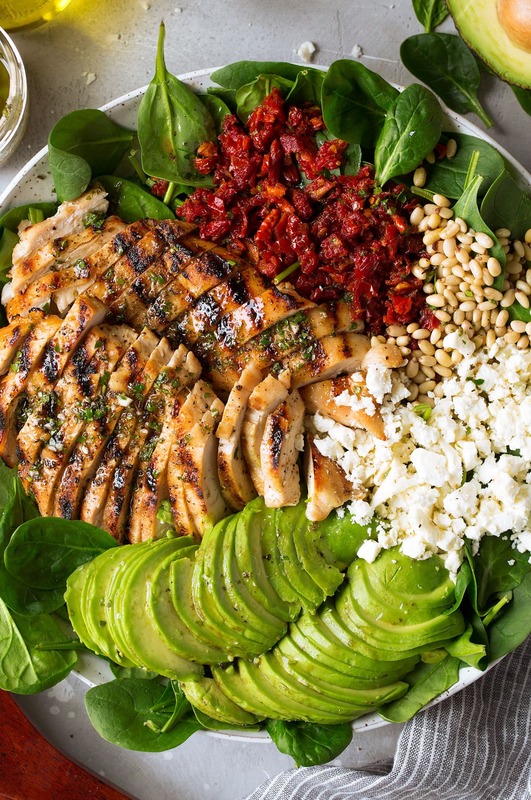 Top with chicken, avocado, tomatoes, feta and nuts. Stir dressing and pour evenly over each serving. Serve immediately.